He is a figure associated with Russian Christmas traditions and New Year's traditions. While Ded Moroz is the Russian equivalent of Santa Claus, he is unmistakably Russian in appearance and attitude, typically appearing in long, Russian-style coats in red, icy blue, silver, or gold, lined or trimmed with white fur. Ded Moroz lacks the conical-style cap worn by the Western Santa and instead sports a rounded Russian cap generously trimmed with fur, and his clothing is sometimes richly decorated with embroidery. Traditionally shown as a tall and slender older gentleman, Ded Moroz cuts an elegant figure on Christmas cards wishing the receiver happy New Year. Ded Moroz carries a staff and sports a long, white beard. He protects his feet from the cold by tall valenki, felted boots popular in Russia, or leather boots. 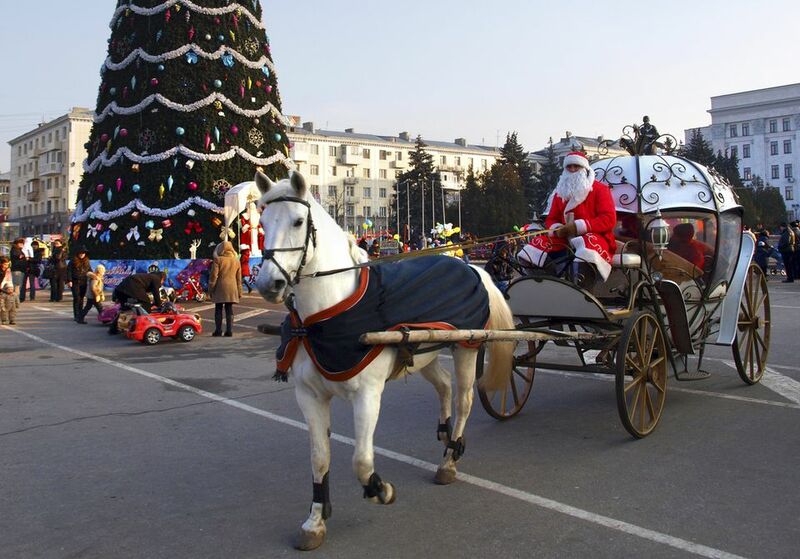 The three horses of the Russian troika offer enough power and speed to get Ded Moroz to where he needs to go...the Russian Santa has no need for eight reindeer. Ded Moroz delivers gifts on New Year's Eve rather than on Christmas Eve due to the shifting of this tradition to the more secular holiday during Soviet times. Incidentally, the holiday tree is the New Year tree, rather than the Christmas tree, though it might appear early enough to mark both occasions, particularly due to Russia's Christmas being celebrated according to the Orthodox Church calendar, after the first of the year. Ded Moroz is often accompanied by a figure from Russian fairy tales, Snegurochka, the Snow Maiden. In the legend of Ded Moroz, she is said to be his granddaughter and is typically portrayed as blonde, rosy-cheeked, and smiling, but this legendary figure also dresses in the wintry colors of the season to assist Father Frost in his efforts to distribute gifts. Instead of the North Pole, the Russian Santa Claus makes his home at an estate in the Russian town of Veliky Ustyug, and children can write their letters to Ded Moroz and send them to Veliky Ustyug in hopes of having their holiday wishes granted. Those who visit Veliky Ustyug can have their photo take with Ded Moroz, ride in a troika, and enjoy wintertime activities. During the holiday season, Ded Moroz makes appearances in major Russian cities, like Moscow, and he often takes part in festivals and parades, so if you're planning on visiting Russia this Christmas season, be sure to check ahead for where Ded Moroz will be making appearances, and be sure to prepare your children for a slightly different version of Santa Claus before your trip.